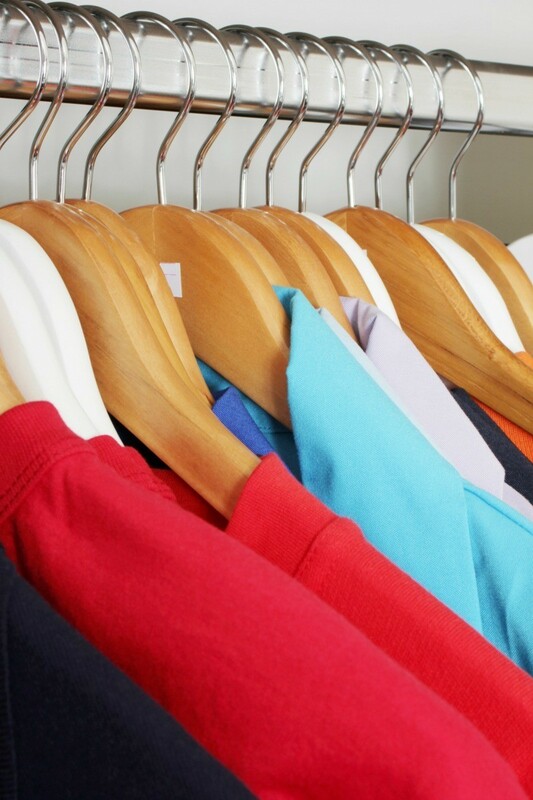 Here is a big list of tips for saving money on clothing. Change your clothes when you get home from work. Wear old clothing around the house to save your nice clothing for when you go out or go to work. Treat stains quickly so they don't set and ruin your clothing. If possible, buy clothing that does not need to be dry cleaned. Dry cleaning is very expensive and can really add to the cost of the piece over time. Put away seasonal clothing at the end of the season. This will prevent you from wearing it because you forgot to do laundry and keep it nice to last another season. Also, when you get out the box, the clothing you put away can feel fresh and new. For new clothing, buy your clothes off season when they are on sale. Stock up on commonly worn items (t-shirts, underwear, jeans) when they are on clearance. Buy clothing in neutral colors that can be worn in more than one season. Pick classic styles that won't look dated when the new look comes out. Use accessories to give the same outfits a different look. Shop at discount stores and outlet stores if you have some in your area. Sometimes, they have the exact same clothes that are currently being sold in the major department stores but at a substantial discount. Buy versatile clothing that can be used in more than one outfit, black slacks can be worn with different jackets and tops or shirts. When buying clothing that you wear a lot, it often pays to buy quality brands that will hold up to frequent wear. Fancy clothing for evenings out, cocktail parties, proms and even wedding dresses can be found for great prices if you keep your eyes open. Try on styles in the fancy stores and see what styles are becoming, then wait for the items to go on sale or look for them at other places like consignment stores, thrift shops and garage sales. Don't buy clothing that you love in the wrong size, just because it is a good deal. Sometimes people stock up, in anticipation of losing those 10 pounds, but may never be able to wear them. Treat yourself to a shopping spree after you get in shape. If you buy something that you aren't sure about when you get it home, take it back! Don't wait to see if it will grow on you, it will sit in the back of your closet. Sell clothing that you no longer use at a consignment store or a garage sale. Clean out your closet at the end of every season. Use the money you earn to buy new clothing. Thrift Shops in nicer neighborhoods have the nicest used clothing. You can often find designer clothing there. Another good place to find clothing are the thrifty shops that are near big malls. The stores quite often donate unsold clothing there that is brand new, sometimes the tags are even still on the item. Garage sales are the place to buy clothing for the lowest prices. Church rummage sales and neighborhood garage sales will give you the best selection. Consignment shops are more and more common. Items are clean and sized. Consignment stores will not accept clothing that is not in good condition or that no longer has value. If you have friends that are a similar size, you can exchange clothing as you get tired of it. Read more tips from ThriftyFun users below. If you are on a limited clothing budget (and who isn't? ), always think SEPARATES. For example, a pair of black pants or a black skirt could be paired with multiple tops to create several different outfits. Different accessories also jazz up your "new" clothes! The most effective way to save money on clothing is, except for underwear and shoes, avoid retail outlets and shop in charity shops/thrift stores, also known as op-shops in Australia. (Op is short for opportunity. I don't know why but in this case think it would be because they give everyone the opportunity to dress smartly for little cash!). Go regularly - you can't just walk in and find that perfect little black dress the day you need it to go to the cocktail party. BUT you can find perfect little black dresses, in perfect condition, for a fraction of the price you would pay in a retail store - you just need to be patient and know the type of clothes your charity shop stocks - some are more casual, some more formal. Decide of the theme of your wardrobe/function of your clothes. Do you need lots of evening wear, smart office clothes, working round the garden clothes, etc. Decide on what colours and styles suit you. Do you like prints or plain colours? Natural or synthetic fabrics? Most importantly - FORGET FASHION. The changing seasons styles are a manufactured need by the FASHION industry........get the connection? This industry only exists on the manufactured need for us all to change the style and/or colour of our clothes each season. If fashion is important to you then go for a classical look - the elegant, classy expensive look does not date! So you have decided on what style/colours/etc. you like, then off to the op shop! There will be many garments not appropriate to your needs - having decided what you want allows you to quickly pass by the inappropriate stuff. Any likely garment you can examine more closely to make sure its will suit your purpose and is in good condition. Then ask yourself where/when will you wear it and if it will go with the rest of your clothes. If the answer is no then put it back - $5 spent on a blouse because its cheap is $5 wasted if you never wear it because you don't have a skirt/slacks to go with it! Unless you live in a very extreme climate I would also question whether you need a summer and winter wardrobe as many thinner layers of clothing trap more insulating air so a light weight T shirt, blouse, jumper and jacket could actually be warmer than a big thick winter jumper. Where I live if it gets cooler it is more cost effective to don a few more layers rather than buy clothes which sit in storage for 9 months of the year. It can't be said enough, shop the thrift stores often. I just bought four BRAND NEW NAME BRAND pairs of pants for my hard to fit son for a dollar a pair. The trick again is "OFTEN". The week before they had nothing that fit him. If ypu spend some time around the house and garden it is thrifty to designate clothes for this - and keep your 'good' clothes for going out. This doesn't mean you have to dress in old or worn clothes at home but neither do your home clothes have to be colour coordinated or very smart. Wearing your smart clothes only when going out, and changing out of them when you get home, before starting gardening(! ), keeps them looking smart and they last longer. Another idea, always used by my late mother was what she called 'housecoats' - a sort of wrap around cotton coverall which protected her clothes when she was cooking and cleaning and she removed before leaving the house. If you're in need of some new clothes, shop your local thrift stores to save dollars,I just bought a dress and a handbag with a matching change purse for $2.00 each and they were brand new with the tags still on them. Kids grow out of their clothes so fast so instead of buying from a department store, shop at your local thrift store such as goodwill, or salvation army. People donate practically brand new clothes and you'll be saving an armload of money. Yard/garage sale are also a great place to find a good deal on clothing! I check the Goodwill first, then the more expensive stores. You would be surprised at what you can find. I just bought a pair of 9 West shoes, still in style and in great shape for $1.99. Who is going to know, but the ultra-wealthy fashionista types, whom I avoid anyway! Beware of consignment stores when buying clothing for yourself. I have found them all to be very overpriced. For example, at one consignment store I saw a Wal-Mart store brand sweater for much more than it probably cost at Wal-Mart! If you haven't signed up to a Freecycle Group in your area - Do it. You can get some great stuff on there. Just go to http://www.freecycle.org and check it out. If there isn't one - start one. I have gotten some great stuff from there not to mention the friends I have met. Also consider to work part time. I know WHAT lol But the store I work at I get 30% off of everything at two stores. That alone is worth the couple of days I work. My wife saves a bundle of $$$$$ on clothing by buying at an upscale consignment store. She wears very nice suits to work that typically cost $200 to $500 at retail (on sale). But, at her favorite consignment shop she buys these very same name brand suites for $5 (on sale) up to $50 (their full price). Some of the suits are brand new and have the original tags still on them! My wife believes that dressing for success is an important part of her very being. With savings like this, she has a few dozen very nice suites... Before she found this store, she paid retail and only had 5 or 6 suits hanging in the closet. And yes, when she tires of them, she simply brings them into the same consignment store and sells them! What a deal! The money you dont give to full price retail stores is you profit for being a smart shopper! Check with some of the churches, in your area, that might have rummage sales to support their ministeries. The one in our area, that does this is the United Methodist Church. The best way to save money on clothing is to make it yourself! Even if you are not the best dress-maker, you can teach yourself. Children's clothes are easy. I taught myself by unpicking a favourite piece of clothing and using this as a pattern, then you know it will fit okay. A bit of trial and error, and I now make all my pants and skirts, and an now working on tops. You can buy lovely fabrics and make clothes for a fraction of the price you pay in shops. As I am a larger size, I find it difficult to find my size in thrift shops. When I shop for clothes, the first place I visit in the store are the clearance racks. Even if they are filled with out of season clothes I can usually find something on the rack that can work in the current season whether it's winter, spring, summer or fall clothing. Recently I went to a local store called JL Plum in Nashua, NH. It's an outlet store for the Chadwick's catalog. I went through their clearance racks and got a spring suit for $4.75 (75% off) and a couple spring type sweaters for $3.50 each. I spent about $30 there but I got 2 full bags of clothes. It's a great store. You mentioned above that you should buy clothes that do not need dry cleaning. I do not do dry cleaning. Everything goes into my front load washing machine (with the exception of my husband's business jackets) as this is a more gentle way of washing clothes. I have used this for all my business clothes and have not had a problem. With mens business pants, what I did is buy an attachment that slips onto my iron so that you do not get that shiny mark on the pants when you iron them (if you cannot find this then use a large mens hanky). My other tips for saving is to put your clothes in the dryer for ten minutes and then hang everything up straight away. This saves so much time on ironing (which we all love to do) and means that when you need to iron that business shirt it has fewer wrinkles and you use less time to complet the job. This leaves more time for the fun things in life. I keep a binder, with pages for each year. In January I sit down and go through my wardrobe and decide what I need clothing wise for the Year. Underwear, new black dress shoes, a Winter Jacket for town, etc. Then I watch all year, and check off each item as I get it. I stick to basic colours and use splashes of colours in tops and accessories only. Also I mark down each item purchased, where it was bought, price paid and a running total for the year (since 2003 I haven't spent more than $100/year). I also mark down what happened to that item. As I get rid of it, wore out and date, poor fit got rid of it, date. etc. This helps me figure out if I'm wasting resources. Sometimes I have gotten a sweater (cardigan, and changed the buttons, to make a nicer looking sweater) if so I mark down changes I made, if it cost, or if I used something else and made 1 item out of 2. Also I shop thrift shops I not only look at ladies clothing I check men's jackets, trousers, and sweaters for items of better quality, that I can wear with minor changes. A little trim, or lace, or buttons moved, can make a big difference. Thrift stores are also a good source of fabric for creating new outfits. Oh, I was just in my room after my post and I noticed another thing I have done. I have color blocked my main clothing items. That helps me know too what needs replacing, I started with navy, as my basic, then added white, in sweaters, and tops, and jackets (washable), then Red. Later I added Black, and tan. You will find that colors go through cycles with designers. I find that there are some colors I look good in and stick to them. So those years I try and buy end of season, and good sales. The following seasons and year these same clothes show up in the Consignment stores and Thrift shops. That's when I really fill up my wardrobe for Cheap! I never pay more than $1.50 for sweaters, and the thrift shop I use more sells them for $1. sale 50 cents. pants are $1. Jeans $5, can't figure out why so much for Jeans? a Jean Jacket on the other hand is never more than $2.50 and often only $1! If you buy blouses that have your basic color groups in them you can match far more of your separates. For example I got a "good blouse" It has red, white, beige, and Navy in it. I can wear it with navy pants, and a red jacket, or a beige cardigan, or red slacks/skirt , Navy Jacket sweater, beige Jacket/sweater or white jacket/sweater. I'm sure you all know that one color makes you slimmer, so if your wearing all navy for example, you could change up your wardrobe with accessories, belts, scarves, jewelery. All of these are relatively inexpensive at the thrift stores too. I don't have a washing machine, but have to use the laundromat in the apartment complex. Very often I see my neighbors "loading" washing machines with minimal amounts of laundry, like 2 t-shirts and a skirt in one machine. Many of them are washing ALL THE TIME! This is just crazy! First, it tears the clothing to wash them all the time, I suspect most of these clothes aren't really dirty either. Studies show that 40% of the wear and tear on clothing is because of all the (excess) washing and drying. Second, this is a waste of detergent too, because you need almost as much for washing a full machine. Third, it's a waste of energy to wash almost empty machines. Jeans can very well be washed after two weeks of wearing. Wear them say five days at time, air out, fold and put back into wardrobe. If you have too, press them at the knees. Trousers don´t get sweaty in the same way as t-shirts, and need not to be washed as often. Also, check if you are really chucking dirty clothes into the laundry basket, or only chuck it away because that's what you are used to. I started wearing some t-shirts two days in a row, changing my pajama less often, etc. It's amazing how much smaller the laundry pile has gotten! I have three criticisms to make of this article. 1.) As it is true that sometimes the same clothes are available at discount stores AND high end retailers (I spoke with a sweater importer who sells the same sweaters to both Neiman-Marcus and K-Mart), in general, clothes from discount and big box stores are not made from the same fabrics. The key to a garment bargain is the fabric. Natural fibers may wrinkle and may require ironing, but, synthetics do NOT wear as well or as long. Blends of natural and synthetic fibers are the worst for wear, although some nylon in a sweater will keep it from shrinking out of size. Of course, synthetics are generally made from petrochemicals. This means that grease- and oil-based substances that fall on your clothes will become part of the material. There is almost nothing you can do to eliminate that olive oil you splashed on your favorite blouse. The other negative thing about synthetics is that they probably will never biodegrade. On the positive side, fleece is generally made from recycled soda bottles and is relatively inexpensive (although many garments carry an unreasonably high price tag). However, perhaps some fleeces contain phthalates. 2.) Neutral colors must compliment the buyer's own coloring. If you followed the Color Me Beautiful method from the 1980s and are a "winter," you know you could never wear "camel," but, it may be true that "magenta" is a "neutral" color for you! If a blouse makes you look sallow, it is not a bargain and it probably won't blend in with the rest of your wardrobe. 3.) I found that statement that thrift shops are increasing in numbers. I recently moved from the greater Boston area -- where thrifts have been disappearing for the past 15 years -- to western Massachusetts just in time to see two thrift shops close their doors. Trying to keep my clothing looking fresh and bright, I am very careful about how and how often I launder it. I have found that if I wear something that I can wear again before laundering, I hang it back leaving it inside out. This serves me in two ways as it airs it out, and when I choose it, shows me that I have previously worn it.